The Extech 407123 meter measures air flow and temperature by placing the sensor into an airway such as a duct or a vent. the sensor is situated at the end of the telescoping wand for convenience and has a protective cover that slides up and down. the meter includes an rs-232 pc interface jack for use with the model 407001 data acquisition software and interface cable kit. careful use of this meter will provide years of reliable service. 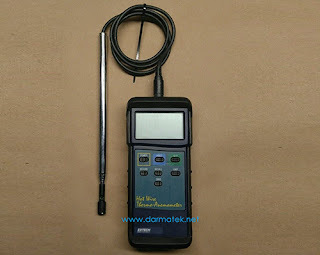 Untuk Info dan pemesanan hubungi : +6281283804273, wa : +6281932632003 harga murah extech 407123 hot wire airflow meter hanya di toko online Darmatek Jakarta selatan..